MicrogridXpert is an autonomous software solution for microgrid users who want to optimize the use of batteries and controllable loads. The software is designed to be used on microgrids consisting of solar PV systems, batteries, and controllable/non-controllable loads. MicrogridXpert is a knowledge-based system being developed to combine optimization and stability into one package. This is done by using a unique multi-layer technique in operating microgrid components. The software uses advanced state of the arts algorithms to predict solar PV production and load needs for the day ahead to create an optimal battery use and controllable load dispatch strategy. The software maintains stability as the main priority and will not implement any action deemed to have an adverse effect on the microgrid or main grid. The software continuously monitors the state of all microgrid components and adjusts to changes within the microgrid and main grid in real time. The user can specify what goals they want to achieve such as minimize utility electricity costs or prolong battery life. 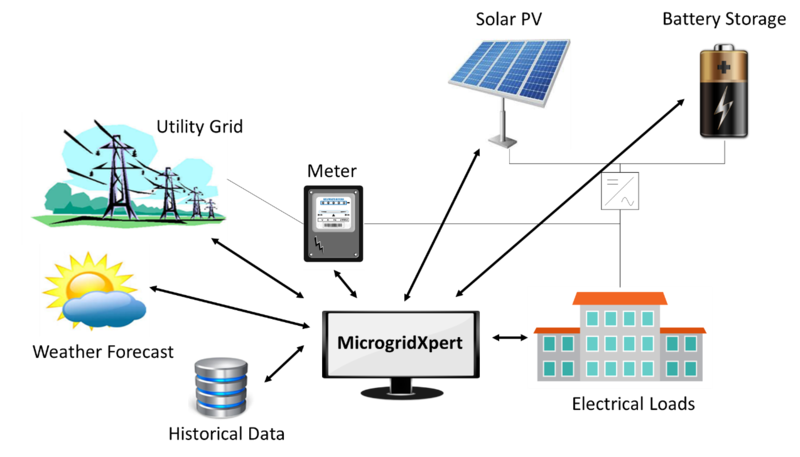 Microgrids using MicrogridXpert will be able to operate controllable microgrid components in the most cost-efficient way while not compromising the stability of the microgrid or producing any adverse effects on the main grid. The software will be scalable and flexible to be seamlessly integrated into various microgrid systems. Plug and play is supported with the user able to add/remove/interchange microgrid components such as batteries or loads with ease. It can be extended to incorporate power production by wind turbines and emergency power systems such as diesel generators. The software can be retrofitted on to existing microgrid systems and can be installed in new systems as well.